Ensuring the happiness of customers and clients has always been a cornerstone of successful businesses. However, employee happiness was not always top of mind. In the last few years, the concept began to gain traction as study after study highlighted the impact a happy work environment can have on company profits. As conversations and research continue to unfold, the topic grabs even more attention. Years ago, dialogue around the subject of happiness would have been reserved for philosophers, psychologists, motivational speakers and yoga instructors. Today, these conversations are occurring globally in offices across the business spectrum going well beyond HR departments. International politicians, governments and the UN are among those discussing the topic. Today, it is common practice to hear economists engage psychologists to discuss how happiness can truly impact productivity. Businesses are pushing to understand how they can apply this concept to their own environments. Why? Because studies increasingly demonstrate how productivity increases when people feel happy at work. You may hear this idea also referred to as engagement, well-being, or “human flourishing”. Bottom line, it all refers back to the same general idea: happy employees mean improved productivity and increased profits. Research around employee engagement and the link to profitability is irrefutable. Findings also show that the effects can be longer lasting than just one particular day. In a recent study from the UK’s Warwick University, economists found that happiness increases productivity by around 12%. Satisfaction and motivation increase as well as an overall feeling of a happier life. 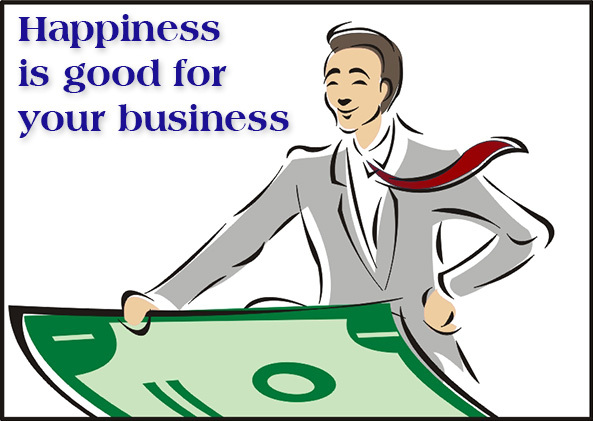 So, even if you’re all about money and money alone, promoting happiness makes good business sense. Having extensive experience in the staffing and recruitment industry, where the needs of both companies and employees can fluctuate often, understanding how to engage employees quickly and the impact positive work environments have on the speed at which contingent workers acclimate to new assignments has always been of great interest. Working with thousands of organizations, managers and leaders over the years has added great insight into the value of a happy workplace. Sharing best practices of positive work environments has now become mainstream. A 2013 Gallup study found that only 30 percent of American employees felt enthused by their jobs; 70% felt they weren’t utilizing their full potential. The 2013 State of the American Workplace Report estimated that extensive disinterest and discontent in professional life not only impacted a company’s performance but also cost the U.S. $450 billion to $550 billion per year. It is clear that making an effort to promote engagement is worth it. Of course it is understood that happiness is unique and very personal; ultimately, we are all responsible for our own happiness. That said, there are things businesses can do to focus, improve and encourage a happy environment. Cary L. Cooper, professor of organizational psychology and health at Lancaster University Management School and co-author of Wellbeing: Productivity and Happiness at Work, shares that poor productivity is often related to poor management. There are simple things that can be done to promote an overall happy workplace. Investigation confirms that salary is usually not the top reason employees leave jobs; feeling under-valued or unappreciated is very often the top reason. Make no mistake, creating happiness takes leadership, purpose and drive. An interesting point uncovered was that as long as people are relatively job-secure and earning a reasonable wage, the quality of working life is, at the very least, just as important. In the Mercer global engagement scale developed with thousands of workers in the UK, US, Japan, India, Germany, France and China, base pay as a motivator comes low down a list of 12 factors that engaged workers. The top motivator was respect: how much employee value and trust does their organization exhibit. Next was type of work: providing good service to customers. Followed by the people one works with then, work-life balance. What has your experience been? Where do you believe the findings will take us? Carla Perrotta is an operating leader who was raised through sales and business development. She has extensive experience in growing and expanding firms. Carla enjoys working with companies in growth mode, turnarounds and start-ups. With years in the staffing and service industries she has a keen focus on their greatest asset, people. She can be reached at: carla@carlaperrotta.com.